Marceline Guerrein aka "Mountain Woman"
As a young woman growing up during the hard times of the depression in the 1930s, Marceline enjoyed being outdoors and hiking the woods of northern Michigan. Her high school graduation slogan was prophetic: Climb though the rocks be rugged. She was no stranger to adversity during her lifetime and experienced the highs and lows life offers each of us. After putting herself through college in the 1940s, she married, had five children and never used her Occupational Therapy degree. After 33 years of marriage and motherhood spent looking after others, the nest emptied and she left for the trail to find a new life and do something for herself. 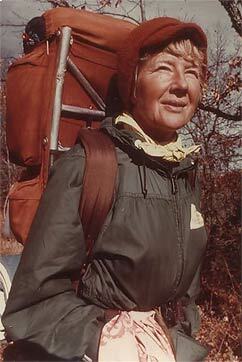 Marceline's desire to hike the Appalachian Trail grew after she completed a 13- month, 4,300 mile coast-to-coast journey called" Hikanation," sponsored by the American Hiking Society in 1980-81. At age 58, she was the oldest female to walk every step of the way. In 1982, with fellow Hikanation alumnus and friend "Walking Bob" Rowe, age 40, she set out from Springer Mountain, GA, headed for Mt. Katahdin. Together they traveled until Damascus, Va., where she became a solo hiker until coming off the trail in Franconia Notch, NH. The summer of 1983, she returned to finish her goal with Hikanation alumnus and friend Tish Butcher, age 23, and together they hiked from Franconia Notch, NH, to the summit of Mt. Katahdin, ME, on a cold, rainy, windswept day. She wrote, "I am satisfied... My journey of 2000+ miles began with a single step." Below are links to images of each page of a Scrapbook that Marcie Guerrein put together after completing the A.T. in 1983. Although all but one of the images are from her 1982 section hike, she apparently did not carry a camera on her return in 1983. The scrapbook photos are not in chronological order, but arranged by her by categories. Page 5: middle photo, far right is Brad "The Gladiator"
bottom photo is "Homespun" (Joanne) and P.J. (Sullivan), a/k/a "P.J. and Joanne"
Page 11: top, Peg O.? bottom right in background, Peg and Steve O. Page 13: top location - Smokies?